Great Z's: Is The Growth Of Epidural Steroid Injections A Consequence Of Too Many Pain Doctors? Is The Growth Of Epidural Steroid Injections A Consequence Of Too Many Pain Doctors? The November issue of Anesthesiology has a devastating indictment of the common practice of epidural steroid injections for back pain. In a study out of Johns Hopkins, 59 patients with cervical radiculopathy received pain medicine plus physical therapy, 55 patients had epidural steroid injections, and 55 had a combination therapy. One month after the beginning of the treatments, arm pain was no different between all three groups, suggesting a lack of effect. However, when measured three months out, the combination group appeared to show significant improvement, 56.9% compared to conservative treatment, 26.8%, and epidural injections alone, 36.7%. In an editorial in the same issue, Dr. James Rathmell, a director for the American Board of Anesthesiology and is involved in the certification for Pain Medicine, notes that epidural steroid injections should never be the first line of treatment for neck and back pain. They should always be part of a combined therapy involving physical therapy, pharmaceuticals, and injections. The patient must also understand that epidural injections don't treat the underlying cause of the pain to begin with. It only potentially speeds up the recovery that would otherwise have taken place with conservative measures. While speeding up recovery sounds good, one must balance that with the potential complications of infection, wet tap, and potentially permanent nerve damage and death when receiving a needle in the back. 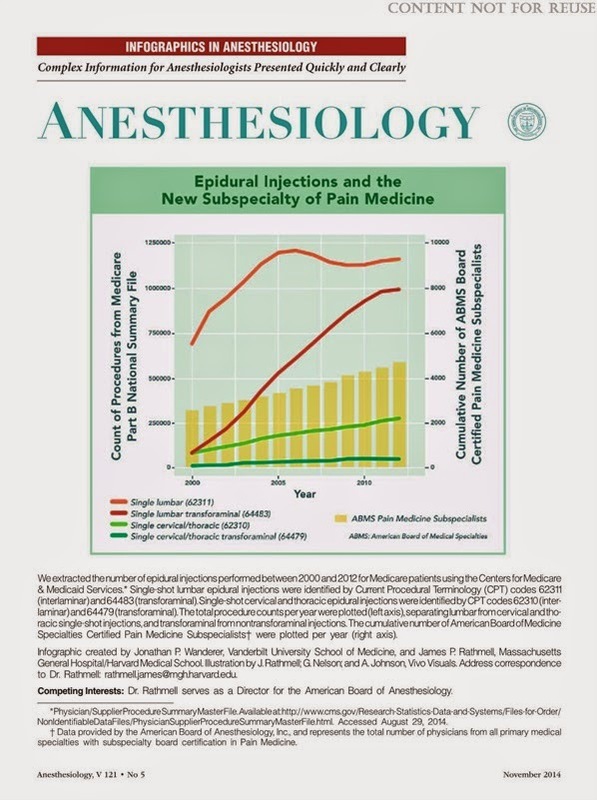 It is easy to see how the rise of Pain Medicine as a desirable subspecialty for anesthesiologists has led to an explosive growth in the use of epidural injections. In an accompanying graph, the number of physicians boarded in Pain Medicine has grown steadily every year, reaching about 5,000 in 2012. At the same time, the number of injections performed have exploded, particularly for lumbar injections. Talk about a growth business, the quantity of lumbar and transforaminal injections have reached one million per year over the last decade. While not as parabolic, cervical injections have also inexorably risen. Is this another case of too many doctors looking for a lucrative source of income? As we all know by now, insurance companies pay physicians much more for performing procedures than to sit and talk to their patients. If pain doctors followed best guidelines and simply prescribed drugs while coordinating with physical therapists and forgoing procedures, how would that undermine their plump incomes? They would be reduced to, shudder...internists. And NOBODY wants to be one of those nowadays.